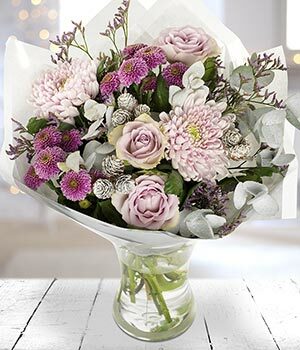 A gorgeous bouquet of soft pink and mauve blooms, accompanied by frosted pine cones and silvery foliage. Lovingly arranged by hand to create a beautiful hand tied bouquet. Featuring roses, chrysanthemum, statice, pine cones and eucalyptus. Your bouquet will be carefully packed and sent in a specially designed flower box.